Situated within the popular well serviced village of Necton, Longsons are delighted to bring to the market this well presented two bedroom detached bungalow. The property offers a wooden garage, sizeable gardens, parking for several vehicles, wet room and UPVC double glazing. Briefly the property offers entrance hall, lounge, kitchen, two bedrooms, wet room, wooden garage, gardens, electric storage heaters and UPVC double glazing. 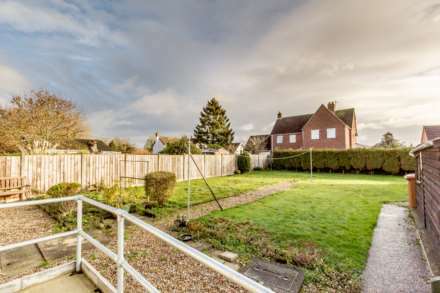 Necton is a popular well serviced Norfolk village with a good selection of amenities, including - village shop, post office, butchers, local pub, doctors surgery, hairdressers, social club, excellent primary school, church and activity park for the children. The village is situated between Kings Lynn and Norwich, just a short drive away from the historic market town of Swaffham. UPVC double glazed entrance door to front, electric storage heater, access to loft. Open fireplace with tiled hearth and surround, double aspect glazing with UPVC double glazed windows to front and side, electric storage heater. Fitted kitchen units to wall and floor, work surface over, stainless steel sink unit with mixer tap and drainer, space and plumbing for washing machine, built in storage cupboard, built in cupboard housing hot water cylinder, space for electric oven, space for fridge freezer, tiled splashback, UPVC entrance door opening to rear garden, UPVC double glazed windows to rear and side. UPVC double glazed window to front, storage heater. UPVC double glazed window to rear, storage heater. Wall mounted electric shower, wash basin, WC, tiled splashback, obscure glass UPVC double glazed window to rear, extractor fan, wall mounted electric fan heater. Front garden laid to lawn, driveway with parking for four to five vehicles, shrubs and plants to beds and borders, wooden fence to perimeter, access to rear garden. Rear garden laid to lawn, wooden garage, wooden garden shed and metal garden shed, shrubs and plants to beds and borders, wooden fence to perimeter.